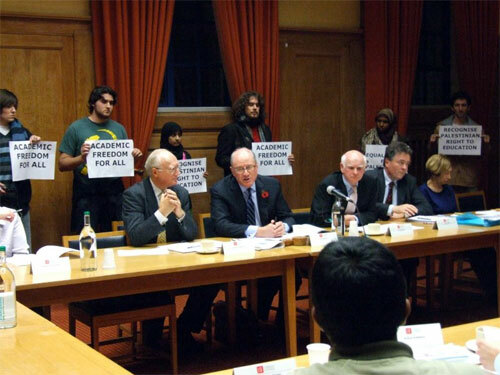 On Tuesday evening, over 20 LSE students silently occupied a meeting of LSE's governing body for over 30 minutes in protest at LSE Director Howard Davies' implicit support for the Israeli occupation of Palestine. Holding up banners stating “Academic Freedom for All” and “Equal Rights for Palestinians”, students peacefully entered an LSE Council meeting, the monthly meeting of LSE's 25 directors, bringing it to a halt, and reissued a request for a meeting with Davies to discuss the issue, as well as that a statement be displayed on the LSE website recognising the right to education for Palestinians. After lengthy deliberation, and threatening to ask security to forcibly remove the students, Davies and Council Chair, Lord Grabiner, reluctantly agreed to attend a meeting and that a statement would be issued that acknowledged Palestinians' right to education. As a Director of a world-class academic institution, Howard Davies should represent a balanced and fair perspective, especially on the issue of the colonization of Palestine. To condemn the discussion of an academic boycott of Israel, but to then ignore their blatant disruption and devastation of Palestinian academic freedom is entirely hypocritical. Davies is ignoring the existence of the hardships and suffering of Palestinian students all together. 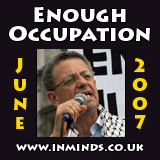 LSE staff and students had twice written to Davies to protest his stance against any debate of a boycott of Israeli academic institutions, as proposed by the UCU (University and College Union) in May 2007. In two subsequent responses (22 June 2007 and 5 September 2007) Davies had refused outright to meet with student representatives. He also declined to address or recognise the desperate condition of Palestinian academic institutions, stating that the School “has no corporate position” on this matter. Widespread student outcry emerged after Davies posted a controversial statement on the LSE website condemning the UCU resolution and any debate on the issue, ignoring entirely the plight of Palestinians. "As a Director of a world-class academic institution, Howard Davies should represent a balanced and fair perspective, especially on the issue of the colonization of Palestine. To condemn the discussion of an academic boycott of Israel, but to then ignore their blatant disruption and devastation of Palestinian academic freedom is entirely hypocritical. Davies is ignoring the existence of the hardships and suffering of Palestinian students all together."